Even though it’s officially Spring, our weather hasn’t quite gotten the memo yet. And wouldn’t you know it, our furnace decided to stop working this week so now our house is freezing. 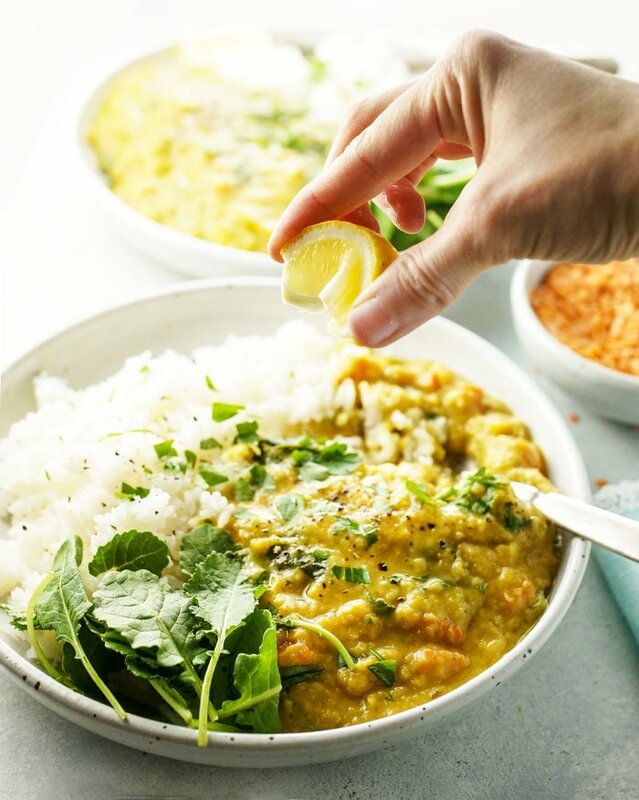 Until it can be fixed, we’re walking around wearing extra layers and keeping warm with comforting meals like this Red Lentil and Kale Curry. I love cooking with lentils because they are a great source of vegetarian protein and are loaded with fiber, which can help lower cholesterol and stabilize blood sugar. They’re also a good source of iron, which helps to carry oxygen throughout the body, and are super-affordable to make healthy eating easily fit into your budget. Red lentils, in particular, are quick and easy to cook, perfect for a fast weeknight meal. Making them in the Instant Pot, or any electric pressure cooker, makes this meal as hands-off as possible, as it’s cooked all in one pot with just a couple presses of a button. Though you’re welcome to make in on the stove top, too! The boys in my family like the vegetables in any meal to be diced as small and uniformly as possible, so that they don’t bite into any large chunks. As a result, I used several small diced vegetables in this curry to make it as picky-eater-friendly as possible. Feel free to add larger chunks if your family will tolerate them, such as cauliflower florets or cubed butternut squash. This recipe is easily adaptable to use any fresh produce you have on hand! To speed preparation, I used baby kale so that I wouldn’t have to chop or remove the stems from larger leaves, but you could also use fresh baby spinach, if you prefer. I hope you’ll enjoy it whenever you need a warm and comforting meal! A quick and easy weeknight curry that's loaded with protein-rich red lentils and baby kale, all made in the Instant Pot. To the cooked vegetables, add in the curry, ginger, salt, and lentils and stir until fragrant, about 1 minute. Press the "off" button to stop the sautéing function. Add in the water, then cover securely with the lid, turning the knob at the top to the "sealing" position. Press the "manual" button, then adjust the time to cook at high pressure for 10 minutes. Once the cooking is done, allow the pressure to release naturally for at least 10 more minutes before removing the lid. Be sure to turn the knob at the top to "venting" to allow any extra steam to release before carefully removing the lid. To the cooked curry, stir in the coconut milk and baby kale, which should wilt quickly. Adjust any seasoning to taste, adding salt and black pepper as desired. (Keep in mind that the flavor will be diluted when you serve this curry over rice, so you can add up to one more teaspoon of salt to bring out all the flavors.) Serve over a bed of warm rice with lemon wedges, if desired. Red lentils cook faster than other varieties, so if you use green or brown lentils I would increase the cooking time to 15 minutes to make sure they are cooked until tender. Stove Top Directions: To prepare this recipe on the stove, simply use a large pot or Dutch oven over medium heat. Sauté the veggies for 10 minutes, then add in the spices, lentils, and water as directed above. Bring the water to a boil, then lower the heat and cover to cook until the lentils are tender, about 15 to 20 minutes. Stir in the coconut milk, kale, and season to taste. Serve warm! 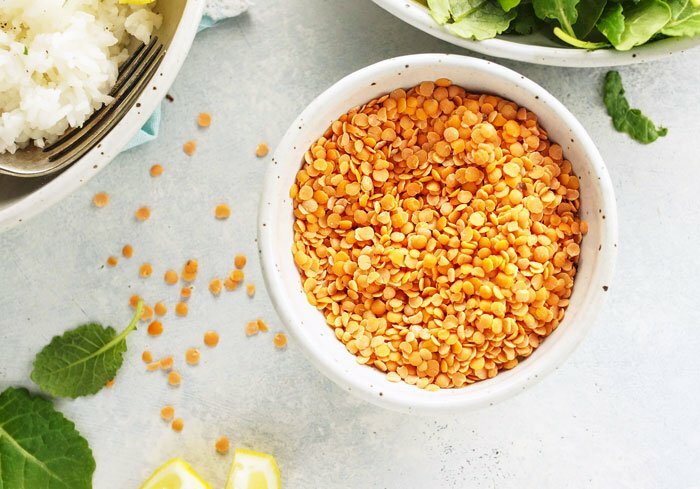 For more healthy recipes made with protein-packed pulses, like dry peas, chickpeas, lentils and beans, be sure to visit PulsePledge.com. 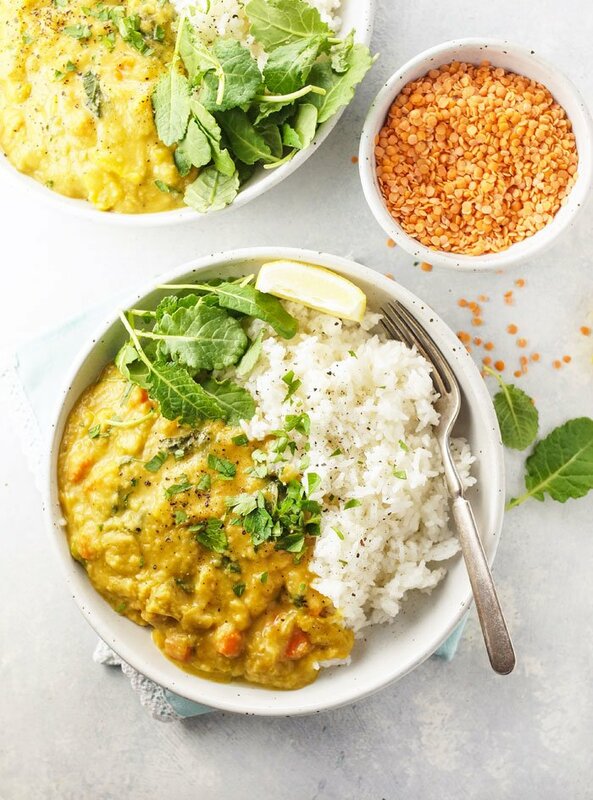 As written, this Instant Pot Red Lentil & Kale Curry provides over 1/2 cup of cooked pulses per serving! Reader Feedback: What’s your favorite way to cook with pulses? Wow! This was amazing!! My husband may have gotten annoyed with me exclaming praise with every bite. Thank you! I made it today following the recipe on The Fresh and Healthy Instant Pot Cookbook. It is very similar to this one (it calls for 2 carrots instead of pepper). It was delicious!! It will be add to our list if favorite quick and easy week meals. Thank you for this recipe! Couldn’t you cook the rice at the same time in the instant pot? Like we do in your Kung Pow Chickpea recipe? Yes, you can do that in any recipe that calls for at least a 4 minute cook time and a 10 minute natural release. I made this in my instant pot last night and the entire family loved it! Thanks for a great recipe! I was hoping this would have a little more texture to it since the lentils went to mush. Maybe I’ll try less time. I made this and we loved it. I usually put the coconut milk in the beginning but adding it add the end made it all taste so much better. The only substitution I made was using a sweet potatoe instead of carrots (because I was all out) it cooked perfectly. Thanks I’ll make this again! I use a 6-quart pot. This was fantastic and super easy.. One of the few times everyone in the family cleaned several plates each. I couldn’t believe it. Especially since it was Meatless Monday. I’m impressed. Has anyone tried doubling this? Should I adjust the cooktime? Has anyone tried doubling this recipe?? Will it change the cooktime? Doubling the recipe usually doesn’t change the cooking time, but it will take the pot longer to come to pressure, so the overall time will be longer. Would the time still be the same if I sautéed the chicken with the vegetables in step one? Thanks! Yes, I would think so! In my experience, using frozen veggies only delays the time it takes for the pot to come to pressure. So, the cooking time wouldn’t change, but the overall time before it’s done might be a little longer. I loved the flavor of this, but it would have been helpful to know to leave out some water if you don’t like your curry soupy. I’m still a total novice with my Instant Pot and I thought I had done something wrong until I read through the comments. This recipe is delicious – thank you for sharing! I topped this off with ground turkey and pepitas – I am excited to try more of your healthy recipes. Hi! If I use split red lentils will that change the cook time at all? I am going to buy the ingredients later, and the store closest to me only has split red. Great recipe. I made it for my lunch all week, and I am enjoying it a lot. Thank you! This was so good! As we were eating it last night, we were already talking about making it again! I made it in my Instant Pot. I used red lentils as you suggested. I didn’t have a lot of kale so added some baby spinach. We served it over jasmine rice. Great recipe! Thank you! I made this tonight and it was so good! I used 2 cups of chicken broth instead of water and added a couple extra carrots. Definitely a keeper. Thank you! Kale, low-fat coconut milk, left out the bell pepper, used farms masala, added a bit of fish sauce for umami. I puréed it and my baby loves it! Will make again. This might sound crazy, but could you freeze this? By the way, I’ve made it and it’s amazing!! Mine turned out nothing like the photo. More like water with floating veggies. Maybe I did something wrong or I need to reduce the water next time. Haven’t tasted it yet but it smells good. Thanks for sharing. Same. Nothing like photo. Watery. I used brown lentils and it was quite soupy but seemed to get firmer after sitting out a while. I liked the recipe but, maybe because of the pressure cooker, it lacked flavor. I’d double the curry spices next time. I never use water in the instant pot. I always use broth or stock and am impressed with the flavor. I absolutely love this recipe, and make it weekly. hmm…I was so excited about this, used brown lentils (cooked for 15 minutes in the IP), and it’s really watery. Any recommendations for doing it differently next time? Way too soupy for my taste. We like our curry to have lots of liquid that we can sop-up with the rice, but you’re welcome to reduce the liquid! Maybe try using 1 cup less water next time? I hope you enjoyed the flavor! Do the leftovers freeze well? I love curry! I could probably eat curry every day, but I find that a lot of recipes for curry taste very Americanized, so I was a bit hesitant to make an entire pot of it that I knew I would have to eat all week long. I am thrilled to report, however, that not only was this incredibly easy to make (I used the stove top method), but it was absolutely addictive! Every day at work as I heat it up someone asks me about it because it smells heavenly. And I’m really sad to say that I only have one serving left, which is rare after eating something four days in a row. I also have a love/hate relationship with cauliflower rice. I love it because I’m allergic to rice and it makes a good filler, but with a lot of dishes the cauliflower flavor comes through a little too much. So I decided to fancy this up a little bit and added tumeric, cumin and cilantro to it, and it blended beautifully with the curry. I will definitely make this again and again. My came out soupy and in 10 min they turned into mush. Where did I go wrong.? This recipe is a bit soupy– my husband likes his curry really runny, so that there’s lots of liquid to sop up with the rice. The only chunks are the vegetables. If you want a firmer lentil, try using another variety like green or brown. I find that red lentils do get mushier, which goes over better with my picky toddler because they add protein and blend into the sauce more unnoticed. If I leave the red peppers out will it impact the flavor? Is there a substitute? Or can I just omit it from the recipe? Thanks! Delicious! made on stove top using green lentils. by mistake I added an entire can of coconut milk so ended up adding some tomato paste to thicken. I also pureed a bit of the mixture as my husband doesn’t like “chunks” of veggies 🙂 also added sautéed mushrooms for more texture. adding this to my weekly rotation!! thank you!!! Just made this and it was DELICIOUS!! Highly recommend it. My bf was pretty impressed that the instapot sautéed like that. I used green lentils (ran out of red), and added two small sweet potatoes too. Great flavor and so easy. The instructions were great, but curious –>do you rinse the lentils? And was it very soupy before you put the coconut milk? Ours looked more like soup. How much garlic do you add to this recipe? Sorry, that was a typo in the directions– it was supposed to say ginger! I just fixed it. 😉 You’re welcome to add a clove of garlic if you like, though. Yummy. This is right up my ally. I haven’t ever added kale to lentils. Will have to try. Love that you explain how amazing lentils are. We love making lentil soups because they are so hearty and good for us! 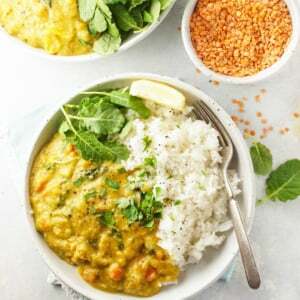 I’ve never had a lentil curry before though so definitely going to try this one soon! I’m loving this recipe and will report back after I try it! Love the instapot instructions!! This looks delish PLUS the fact that I can make it in the IP makes me even more excited to try it out! Thanks!